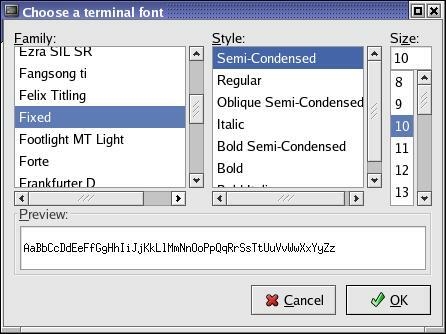 attached screenshot of my gnome-terminal font selection dialog. XLFD doesn't use "Regular" for either. So, where does the "Regular" come from? characteristics, even if they want to edit files like "fonts.conf"
It turns out that one can compose a list of "value-descriptive"
a user should get to see, and automating the selection for them. user terms, in my opinion. >>It "works?" How do you define "works?" > It met the goal(s) of my original list posting. > which font I saw as "Fixed" in gnome-terminal. > satisfactory short term solution. > know much about the details of the original XLFD specification. > font I wanted to use. >>not otherwise uniformly classified across font-handling applications.